Seattle is known for varied cuisine that manifests in gourmet, local, farm fresh eateries; nationally renowned breweries; new takes on global street food; artisan dessert spots; organic, vegetarian fare; and northwest fine dining at its best. The designers who envision the restaurants that make Seattle a food connoisseur’s delight are envisioning more than just a functional flow; they are envisioning a complete experience. Their work must not only reflect the essence of the food being served, but also invite the patron into a different world — one that makes them want to sit down and stay awhile. The architects listed below have both the vision and the practicality. 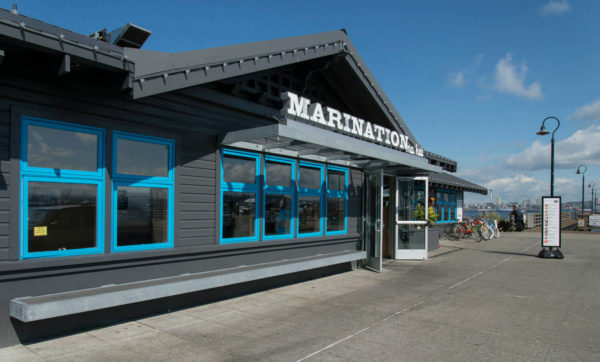 They have all contributed their distinct mark to Seattle’s palate-pleasing and visually inviting culinary hot spots and will no doubt continue to help evolve the city’s intimate, artisan-inspired restaurant culture. Coates Design values their particularly strong focus on sustainable design and green building techniques. They enjoy solving the more complex problems presented to them and providing affordable and graceful design solutions. Matthew Coates, president, founder, and principal architect, believes in a positive team spirit and versatility in energy use and material choice. Some of the larger-scale projects he’s overseen include the Bainbridge Island Museum of Art, the Harrison Urgent Care Facility, and the S’Klallam Tribe Youth Community Center. The Bainbridge Island Museum earned LEED Gold, and the firm’s work has been featured in Inside Bainbridge, the Seattle Times and the Bainbridge Island Review. Though Coates Design is just now making their foray into restaurant design, they are a firm that brings Bainbridge Island’s necessary voice into the evolving face of Seattle eateries. Coates Design’s Eagle Harbor Market Building on Bainbridge Island is a testament to the firm’s ability to integrate the natural beauty of the island and the urban charm of the city into a design aesthetic that sings Pacific Northwest chic with an industrial flair. 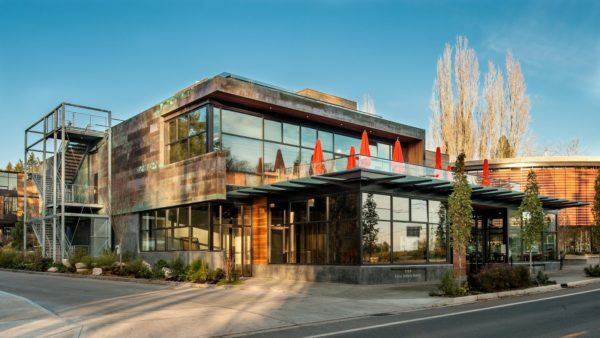 The building encompasses both restaurant and retail and features a habitable green roof, copper panel cladding, horizontal ironwood siding, and a concrete base. As a neighbor to the Bainbridge Island Museum of Art, the Eagle Harbor Market edifice needed to gracefully integrate with its surrounding structural counterparts, and it does so seamlessly. Varied seating options, both outdoor and indoor and including a covered outdoor fireplace, make this a base for shared meals, shopping and community. GM Studio provides comprehensive architectural and interior design services and has implemented their distinct aesthetic on Seattle restaurants and residences. The studio holds LEED certification, along with architectural licenses in Washington and Hawaii. Principals Laura Gardner and Hiroshi Matsubara received their Master of Architecture from UCLA and bring more than 20 years of experience to their work. GM Studio prides themselves on executing design that reflects the richness of simplicity and the spirit of place. Though their presence is still growing, their well-crafted and unique approach to space marks them among Seattle’s creative crew of designers bringing versatility, out of the box thinking, and elegance to the Seattle vision. Girin, a tasteful, modern expression of traditional Korean cuisine, uses its design to reflect the contemporary ingenuity of its culinary offerings. Using narrow length to their advantage, GM Studio designed a gorgeous bar seating area, sectioned off from the main area by a wood framed divide. Can lighting; an arched, exposed wood beamed ceiling; handsome yet simple wood exterior materials; and classic, low benched table seats provide a truly distinct and authentic final product. Momiji Restaurant is another stunning example of GM Studio’s distinctly rustic meets contemporary design aesthetic. The firm employed their creative use of textured wood paneling again with Momiji, while boldly pairing different textures and finishes to create a warm, glowing interior. Other highlights include a handsome overhang beside a classic Japanese garden. Suyama Peterson Deguchi, founded by AIA fellow George Suyama in 1971, has been bringing their prowess for clean, bright, functional design to the Seattle area for over four decades. The firm’s versatility includes work on residential design, office space, restaurants, and other commercial facilities, and they pride themselves on their Northwest contemporary design aesthetic. Suyama received the AIA/Seattle Medal of Honor and is dedicated to creating an “ambience of place” through his work. Business partner Ric Peterson is also an AIA fellow and has been working with Suyama since 1978. AIA member Jay Deguchi completed graduate school at UCLA and joined the team in 1992, becoming a partner in 2002. Some of the notable awards the firm has received include, the AIA Seattle Merit Award, the AIA Northwest & Pacific Region Honor Award, the Seattle Homes + Lifestyles Design Achievement Award in Architecture, and the Excellence in Concrete Construction Award. The Canlis Bar & Lounge is a stately, fashionable remodel that features a large stone fireplace, high ceilings, a bar with an enclosed staircase backdrop; cozy, varied seating options; and heavy, thick design elements — all of which make the venue feel like a classy lodge in the middle of the city. The Frontier Lounge, a landmark in the Belltown neighborhood, needed renovations and alterations to its interior volume. Suyama Peterson Deguchi successfully transformed the space through the careful use of layering and precise material selection. Partially closed-in wall divides and a crafty combination of metal, checkered tile, wood, and steel creates an eccentric, contemporary beauty. BjarkoSerra Architects was founded in 1992 and has grown its distinguished status in Seattle’s design scene ever since, with varied project types that include vacation homes, multi-family residences, religious institutions, day care and community centers, fitness and health facilities, multiple restaurants and microbreweries. and now offices. They have had work featured in the New York Times, Luxe, Arcade, Dwell, Seattle Homes and Lifestyles, Seattle Magazine/Northwest Home and Garden, Pacific Northwest, and Seattle Metropolitan. Founders Greg Bjarko and Chris Serra met as architecture students in Bozeman, Montana, and they ended up blending their expertise after gaining experience with other firms. BjarkoSerra has been honored with the AIA Honor Award commendation and the AIA Home of the Month designation. BjarkoSerra’s work on Brouwer’s Cafe began with a curved steel structure hanging from the two-story hall. This bold stylistic element is complemented by the 70-foot beer bar below. Brouwer’s is all about geometric lines and shapes and the careful choice of raw material to conjure up the feeling of beer-hall from days gone by. The space has an intentionally tattered grace that is beautifully executed by the firm’s expansive vision. On the shore of Lake Union rests the Westward, a transformed 1970s vintage two-story restaurant that BjarkoSerra renovated with an exterior facelift, the addition of reclaimed wood siding, new aluminum windows and skylights, and a beautiful folding door that opens up to the outdoor dining space which faces the lake. Founded in 2011, Best Practice dedicates themselves to providing unique solutions that balance function, content, and beauty. They are accustomed to working on diverse projects, including residential, office, restaurant, and cultural. Their small team is led by AIA member Ian Butcher, who received his Master of Architecture from the University of Washington and also holds a bachelor’s degree in environmental design from North Carolina State University. He has taught in the Interior Design department at Cornish College of the Arts and has serves on the board for ARCADE Magazine. Best Practice has been recognized in Architect Magazine, Frame Magazine, WeAr, Gray Magazine and Interior Design Magazine. 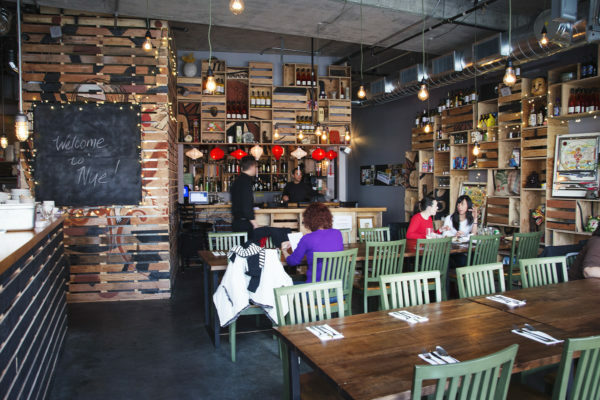 Nue restaurant on Capitol Hill, which features international street food, is designed like a global shipping crate. Its eccentric charm is gracefully integrated with a well-functioning layout, exposed piping, simple lighting, an open kitchen, and large windows. The total dedication of this design concept to a loud, bold aesthetic makes it feel exciting and ultra urban. Cupcake Royale, the new cupcake bakery and ice creamery cafe located in the Queen Anne neighborhood, features a creative fusion of design elements that almost make the space feel like its own dessert. Bright and airy, with a combination of can lights, hanging light fixtures, varied wall and ceiling textures, and walls of windows, make the cafe as desirable as their confections. Board and Vellum represents a trifecta of design expertise, including architecture, interior design, and landscapes. They know how to generate the industrial aesthetic of popular local breweries and the hip gleam of urban tea cafes. AIA member and principal architect Jeff Pelletier received his degree from Cornell University’s architecture program. He founded Board and Vellum in 2011, bringing his professional experience in restaurant, residential retail, and commercial projects into his new vision. Board and Vellum now has a staff of over 30 and is growing their notable presence in Seattle. Pelletier was recognized in Puget Sound Business Journal’s “40 Under 40” and Seattle Business Magazine featured the firm as one of Washington’s 100 Best Companies to Work For in 2017. Nestled in the South Park neighborhood, Lowercase Brewing and their local craft beer made a splash and grew their presence quicker than they anticipated. After discovering a new location in Georgetown where they could expand, they brought Board and Vellum on to the project to help the design pair well with the industrial aesthetic of the neighborhood, while also crafting a welcoming and down-to-earth atmosphere. Glass-paned garage doors, large windows, salvaged planks used to create rugged wood paneling, and an outdoor seating area do the trick nicely and make the establishment handsomely unique. Oasis Tea Zone, a hip cafe specializing in bubble tea, was placed into a partially remodeled storefront in the Pike-Pine corridor. With the intention of keeping construction costs reasonable, Board and Vellum was savvy with their incorporation of an open railing (to replace the remaining partial-height wall), a walnut wood slat canopy, and an attention-grabbing, blue stained wood counter base and backsplash wall. Bright, white hanging light fixtures polish off the bold, smooth look. Heliotrope is known for their contemporary designs and their process-driven work. Established in 1999 by Mike Mora and Joe Herrin, Heliotrope’s work has called attention regionally and nationally. Their diverse portfolio encompasses high-end restaurants, retail stores, private residential commissions, and public spaces. Heliotrope has received eight AIA design awards, including the AIA NW & Pacific Honor Merit award, the AIA Washington Architecture Merit award, the AIA Washington Civic Design Citation award and the National AIA Housing Honor award. Their projects have been featured in Pacific NW Magazine, Metropolis Magazine, Gray Magazine, Architectural Digest, and recently New York Times. They hold offices in both Seattle and Portland, making themselves a formidable force in the Northwest’s elegant yet rugged architectural circle. The Whale Wins, an acclaimed 1,600-square-foot building that produces delectable European and NW-inspired dishes, spotlights Heliotrope’s ability to make an old canvas feel brand new. This converted warehouse is cheery and refined, with white-washed wood walls, open shelving, marble countertops, and spacious high ceilings. Other standouts include sliding turquoise doors, large windows, and a handsome brick oven. Cafe Juanita has become famous for the intimate, fine dining experience it offers by preparing Northern Italian fare with Northwest ingredients. Heliotrope was tasked with elevating the quality of their space to better represent the quality of their food and service. Heliotrope’s design solutions worked to incorporate the strength of the existing structure while revisioning the aesthetic. This meant taking the interiors down to their studs and constructing additions to allow for a new entry, new restrooms, an expanded kitchen, and a 40-seat private dining room. Shed’s modest team bases their design values around the healthy integration of pragmatism and idealism. They have taken on projects ranging from $250k to $25M and are consistently versatile, working in restaurants, office spaces, mixed-use commercial spaces, and residences. Principal Thomas Schaer received his Master of Architecture from the University of Washington and an undergraduate degree in business administration from Babson College. The firm’s other principal, Prentis Hale, earned his Master of Architecture from the University of Washington as well and has an undergraduate degree in history from Yale University. The firm’s work has been recognized in Gray Magazine, Inhabitat, 1889 Magazine, Remodelista, Curbed, the Seattle Met, Seattle Magazine and the Seattle Times, among others. The gorgeous remodel of a 1,479-square-foot bistro and bar in the Ballard neighborhood utilized two connected, smaller buildings to open up the dining area to the kitchen and provide views of the garden patio. Not only did this project require technical problem solving, but it also showcased Shed’s stunning vision and ability to execute unique visual charm for every project they touch. Wood paneled walls painted white; a classy row of elegant, hanging light fixtures; glossy wood and steel counters; and a set of three French doors make this bistro feel both Old and New World. Hecho, a hip Mexican restaurant on Phinney Ridge, seamlessly weaves an eccentric combination of textures, colors, and styles to create a surprising flow of beauty, boldness, and distinction. Ceramic tiles, hand-hewed tables, lantern-like light fixtures, and curvy metal work create an undeniably inviting atmosphere for eating with friends or enjoying a tequila or two at the L-shaped bar. Allison Hogue and Richard Floisand founded Floisand Studio in 1999, with the intention of cultivating a highly collaborative environment and a team who prized meticulous attention to detail and expressiveness. With an intimate team of five, Floisand has still managed to receive recognition in Pacific Northwest Magazine, Seattle Magazine, Sunset Magazine, ArchDaily, the Seattle Times, The Stranger, and Coffee Time: Contemporary Cafes. They’ve received the AIA Seattle: 2016 Homes of Distinction award and the Green Building of America Award. Floisand is proud to have joined Seattle’s 2030 District, a collaborative of engineers, architects, utilities, businesses, property owners, and organizations. Pagliacci’s artisan pizzeria is a gorgeous integration of dark brick, white stucco, glass, variegated wood, attention-calling signage, and a curved bar table. 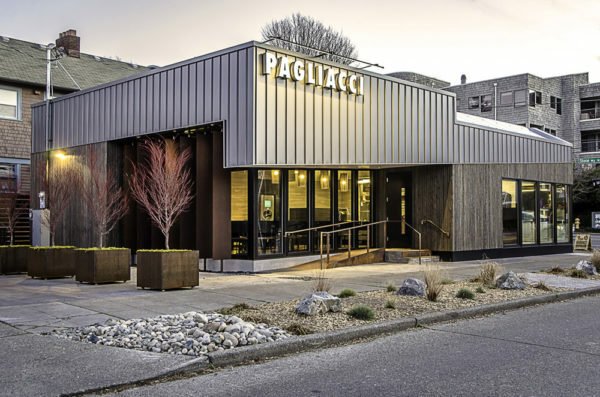 Not only is Pagliacci LEED Gold certified, but it’s also the first stand-alone pizzeria in Seattle to receive this certification. Floisand worked hard to think through environmental impacts and create an efficient building envelope. Notable features include LED lighting, skylights, and a contemporary, boxy exterior shape. The Fonte Coffee Roaster and Wine Bar in downtown Seattle began as a second-rate canvas at the base of the Four Seasons Hotel. The low ceilings and the limited natural light was less than ideal. Floisand dove in for an efficient buildout that included curvy steel columns; a well it bar; rough, sawn cedar soffits; house lighting; and raised white leather benches. The transformation of the space was dramatic, creating a cozy, clean, and intimate feeling that makes it easy to sit down and stay awhile. Graham Baba has worked with restaurant, office, residential, and art spaces, and they bring their passion for subtle and economic design to every project they take on. Their restaurant work has been particularly city defining and the firm’s impact was described in a Seattle Times’ article as work that creates spaces where diners want to stay. The 24-employee team has been recognized with the 2017 Architizer Award, the 2017 Chicago Athenaeum: Museum of Architecture & Design Award, the AIA Seattle Merit Award, the AIA Northwest & Pacific Region Honor Award, the AIA Central Washington Honor Award, and the AIA Central Washington Citation Award, among many others. Jim Graham and Brett Baba bring over 50 years of experience to the firm collectively. The firm’s capacity for creative collaboration with clients and their vision for the unique character embedded in spaces makes them shine as one of Seattle’s leading giants in architecture. Rock Creek, a full-service restaurant in the Fremont neighborhood, was built with local and reclaimed materials, which include bark beetle pine tables and repurposed farm equipment. The outcome of this spacious structure is rugged yet refined. The high ceilings feature skylights and the handsome bar adjacent to the kitchen rests below upper-floor seating and steel railings. Shake and Spear is an eclectic yet stunningly executed combination of exposed brick and steel, slatted ceilings, wall wine shelf builtins, tile accents in copper and wood, and a windowside countertop. Eltana Bagels, an entirely vegetarian bagel spot with a location on the ground floor of the Packard Building, required Graham Baba’s knack for envisioning a space that could accommodate customer flow and simultaneously speak to the character of the establishment. Their design manages to highlight the unique wood-fired bagel preparation. Other sweet touches include a community table and a large, operable garage door storefront.